Polk County Sheriff Grady Judd, who threatened to arrest anyone with an outstanding warrant that tried to weather the storm in a Polk County shelter, came under fire on Sputnik Radio's Loud & Clear. "He should be fired," said Kiriakou, a former CIA whistleblower. "That is such an outrageous assault on civil liberties, where if you've got a couple of outstanding traffic tickets for example, you risk arrest. So what happens then? People either stay home or go someplace that's not necessarily safe rather than going to a shelter and actually risk their lives… just to avoid this arbitrary arrest." Co-host Brian Becker asked Ruth Beltran of the Tampa Chapter of Black Lives Matter, based in the county adjacent to Judd's, if she had observed a deterrent effect as a result of Judd's comments. Beltran said it was a "great deterrent… I know people that did not want to go to shelters for that reason. There were also a checking for I.D. 's which impacted the immigrant community. I believe [Judd] should be fired." Kiriakou also brought up an occurrence even rarer than two major hurricanes striking the US within a month of each other: a Republican blaming a natural disaster on climate change. "The Republican mayor of Miami Tomás Regalado said something that was very interesting. He said this is the time to talk about climate change, this is the time that the president and the E.P.A. and whoever makes decisions needs to talk about climate change. If this isn't climate change, I don't know what is." The show's second guest, board member of the Sarasota Peace Education and Action Center Juliana Musheyev, said that she thinks "we should be talking about climate change probably ten times more than we're talking about it on a daily basis. It's going to be one of the defining factors in a lot of people's lives, especially young people who are going to be experiencing a future where storms like this and worse are the norms." "We need to not only start talking about mitigating climate change, but on the coast of Florida, no matter what we do at this point, people are going to have to be relocated inland. We need to start having a government and a system that takes that into consideration and plans out how we're going to save people who don't have the resources to jump in their car or to buy a house inland. We need to start thinking about the people who are going to be truly impacted by these kinds of things that are becoming way more common and will become way worse in the future." 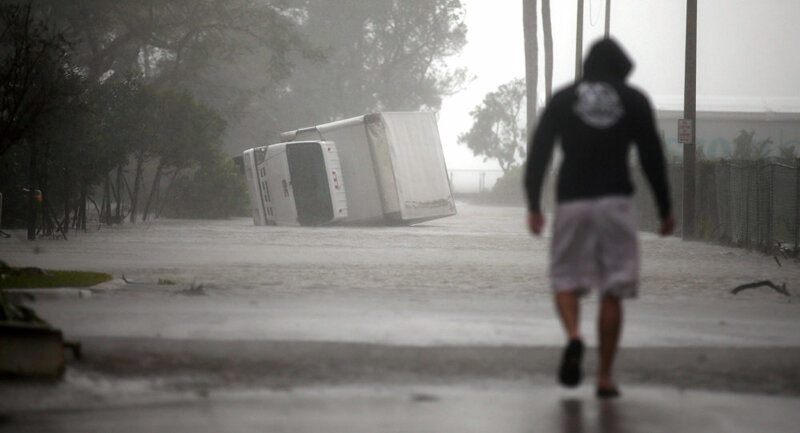 Hurricane Irma has killed at least 12 people in the Sunshine State thus far: six in vehicle accidents, four during evacuations, and two by electrocution.